According to Google, this is because Meet "provides significantly better performance" with "a cleaner, more focused user experience" and a "simple, secure and reliable method for guests to join meetings." A lot of effort has been put into getting Meet right, including creating custom hardware for the service. It's also been regularly updated with new features such as the recent addition of calling out to US and Canadian phone numbers. In its message to G Suite administrators, Google has also stated that you can opt out of the enforced change for a further 4 weeks by navigating to Apps > G Suite > Google Hangouts > Global Settings, although it might be worth just rolling with it at this point. You can compare the two options and learn more about Meet here. Meet currently only supports Google's own Chrome browser, although support for Mozilla Firefox is coming ahead of the automatic activation in May. Support for Safari and Internet Explorer is promised to arrive before the end of the opt-out period. See here for full details of the transition plan. Due to positive customer feedback regarding Hangouts Meet—our new improved video meeting experience—we will begin enabling Meet starting 21 May 2018 for all newly created meetings in Google Calendar. Meet provides significantly better performance over classic Hangouts video calls. It features a cleaner, more focused user experience and a simple, secure and reliable method for guests to join meetings. Since launch in March 2017, we've updated Meet to include an API for reporting, phone dial-out and in-meeting chat. We also recently introduced the Hangouts Meet hardware room kit and for G Suite Enterprise customers, we added support for up to 50 participants, more international dial-in phone numbers, and the ability to record meetings to Google Drive. We just introduced the ability to include US dial-in phone numbers to all Meetings created by users with G Suite Basic and G Suite Business licenses. Looking forward, we are excited to be bringing Meet compatibility with Firefox browsers in May. When will Google automatically transition my organization to Meet? The transition from classic Hangouts video meetings to Meet for your organization XXXXXXXX will start after 21 May 2018 - no action is required. Newly created Calendar events will contain Meet video meeting details. What if I need more time to prepare my users? 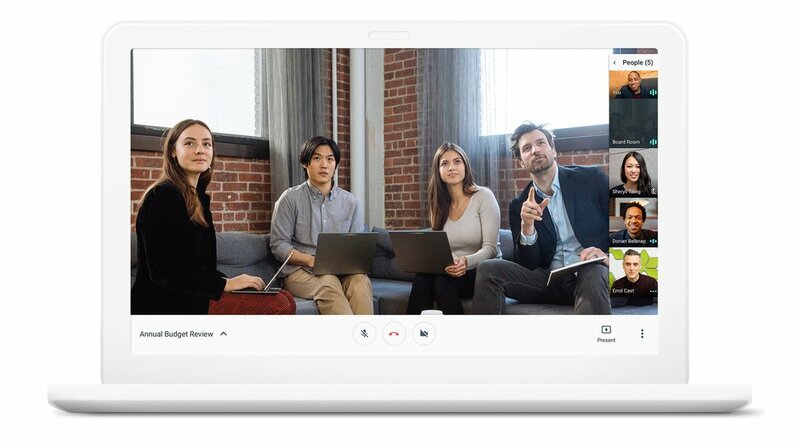 You can temporarily extend your use of classic Hangouts as default video conferencing option for at least four weeks by opting out under Apps > G Suite > Google Hangouts > Global Settings. From June, your Calendar events will include Meet video details instead of classic Hangouts links. Previously created classic Hangouts video links will still be usable until at least August 13, 2018. For a full comparison of existing and coming features between classic Hangouts and Meet refer to this Help Center article. Which browsers will Meet support? Please note that Meet does not support Internet Explorer or Safari browsers. If you have video conferencing users who are using these browsers, please review the details of the transition plan and consider whether to opt-out of automatic activation of Meet in your settings in the Admin console. Compatibility with next stable version of Firefox is expected in advance of automatic activation in May and a solution for Internet Explorer and Safari browsers will come in advance of automatic activation with no opt-out. Can my users set a custom event URI in Meet? Meet video meetings have fixed, unique URIs to improve guest access reliability. Customers who need more time to switch from custom URIs with classic Hangouts may consider delaying the enablement of Meet and prepare their users. Review the details of the transition plan and the differences between classic Hangouts video calls and Meet. Try out the new experience today by enabling Meet in your Admin Console: Apps > G Suite > Google Hangouts > Meet settings. Communicate the upcoming changes to your users, using the resources in our Help Center. Determine whether you want to delay automatic enablement of Meet in the Admin console at: Apps > G Suite > Google Hangouts > Global settings. Further details about the these upcoming changes will be communicated closer to the time of change via the G Suite Updates blog. For more information including resources for communicating to users and other details regarding the transition, please see our Help Center. If you have additional questions or need assistance, please contact G Suite support and reference issue number XXXXXXX. This change only affects G Suite users. Hangouts video calls will still be available to all other regular Hangouts users. Meet and Chat are business-focussed forks of the app and as such aren’t available to regular users. Apologies for any confusion.